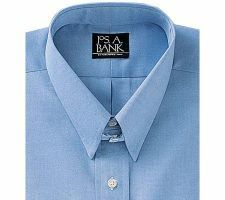 Mens fitted dress shirts are the more expensive shirts that you’ll wear with a suit and tie. These shirts should be 100% cotton, and will be noticeably smoother and more high-quality than your sport shirts. 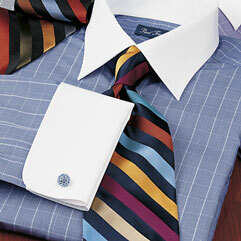 Unless you wear a suit to the office most days, you won’t need that many dress shirts. They are expensive, so unless you need one for each day of the week there’s no need to make that investment. Just get a white one, a blue one, and maybe a striped one and you’ll have all you need. Go for quality over quantity when it comes to these. Dress shirts are made to fit precisely. If you don’t know your size, go to a high-quality department store or a tailor and get measured. One of the most important things to keep in mind when buying dress shirts is sleeve length. The dorkiest-looking thing I can think of is when you see a dude in a suit and when he extends his arm you can’t see any sleeve, just bare wrist coming out of his suit jacket. So if any of you reading this pull that trick, or even worse wear a short-sleeved shirt under your suit, stop it. When you have your jacket on, you should be able to see about a quarter inch of your shirt cuff. When your arm is at your side, the cuff should be about an inch below your wrist bone. Its crucial to get this part right, no matter how long you have to search to get the right fit. Now remember, mens fitted dress shirts are supposed to fit snug. When you do up the top button, its not going to have a loose fit like your sport shirts (which your not supposed to do the top button on anyways). You should be able to fit two fingers in between the collar and your neck. If its tighter than that, its not a good fit. 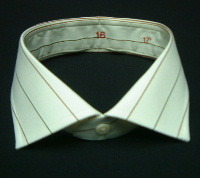 Point collar. This is the most common and versatile collar type. You can wear this with a suit with no tie, or with a tie, or with a sweater- whatever. Like I said its versatile. Spread Collar. This is a classy, real confident look. You really need a tie with this one or it would be too spread open in the middle. Tab Collar. This is a real dressy look. Very GQ. This is beyond most guys needs for dressing up, but it looks great when you decide to use it. You definitely need a tie with this one. 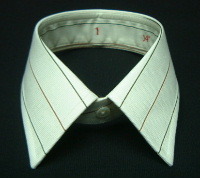 White-contrast collar. This is one of my favorite looks as far as mens fitted dress shirts. This gives a real sophisticated look, really sharp. This is more of a shirt type, because the collar on these can come in the different collar types we’ve gone over like spread, tab, and point.